If you’re reading this you’re likely interested in how to get a 30% conversion rate on your Facebook contest. On January 17th Heyo customer and CEO of Out and About Marketing, Milena Regos, launched a Facebook contest for her client, Squaw Valley. 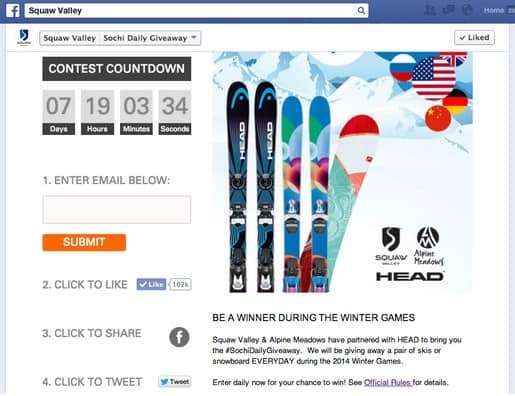 Squaw Valley wanted the contest to drive additional likes for the page in addition to capturing fan emails. Over the first 11 days, the campaign has converted at over 30% and helped drive 6,975 new likes. If you’re interested in getting more likes, capturing more emails, and driving a 30% conversion on your Facebook contests, keep reading. Once you’ve crafted a strong incentive, created urgency, and structured your campaign so that it gets free traffic (self-sustaining), you’re well on your way to higher conversions. Have you run a Facebook campaign like Squaw Valleys before? Tell us in the questions below. Nathan Latka is CEO and Founder of Heyo, a drag and drop tool for creating Facebook apps that are mobile optimized.